Charming country vacation home minutes to Jay Peak. Large comfortable Living room w/stone hearth fireplace, classic chef's Kitchen with Jenn-Air appliances incl. six burner gas range, granite counter tops, Kit Island w/seating, wide plank pine flooring, 1FL laundry & bath. 4BR upstairs incl. MBR w/brick fireplace & sliders to 2FL balcony. Attached 1 car garage + full unfinished heated basement. Interior Features Comfortable Living room w/stone hearth fireplace, classic chef's Kitchen with Jenn-Air appliances incl. six burner gas range, granite counter tops, Kit Island w/seating, wide plank pine flooring, 1FL laundry & bath. 4BR upstairs incl. MBR w/brick fireplace. 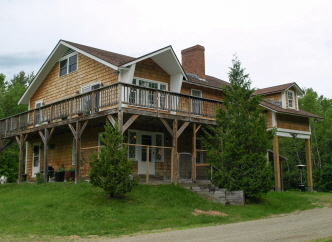 Exterior Features Charming country vacation home minutes to Jay Peak. New sliding glass doors from MBR to 2FL balcony. Additional Features and Amenities Attached 1 car garage + full unfinished heated basement.